Can you even dive in Burlington, Vermont? 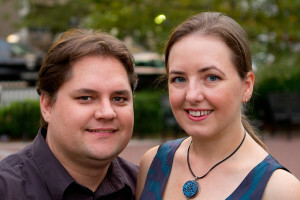 Kerensa decided that we should book it to Burlington, Vermont to get out of the summer heat of North Carolina. Of course, the first thing I did was get online to see if it was even possible to scuba dive in Burlington. It turns out that yes, you can dive in Burlington and it’s pretty damn good diving too! It doesn’t really matter how good the dive was when you surface to a view like this. A quick Google search came up with Waterfront Diving in Burlington. Their site contains a list of historic canal boats that sank in the cold fresh water of Lake Champlain. 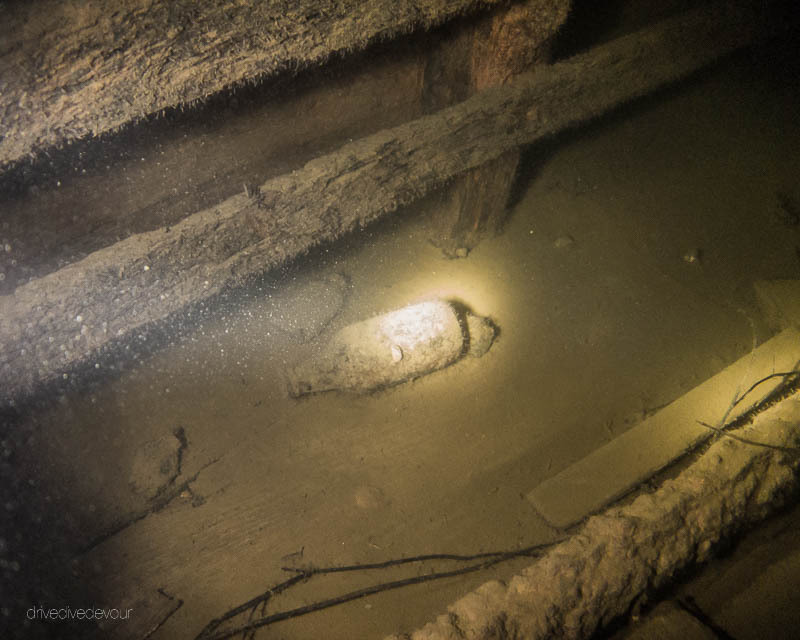 As a shipwreck hunter, the news of well-preserved wooden wrecks really intrigued me. The next step was to find some locals to show me around. I put up some posts on Scubaboard and connected to the Vermont Divers Facebook group to find some fellow divers to point me in the right direction and take me out for some dives. Little did I know this would lead to one of the most interesting dives I have done to date. I went on nice evening dive with a couple of the locals I met through Facebook. I didn’t realize at the time, but they were testing me to see if I was capable of conducting a dive they had planned later that week. We met up at a location called Thompson’s Point. There isn’t much to see here, but it is one of the deepest places in the lake. From the shore, we were able to gradually swim down past 100′ to cruise along a ledge that drops deeper into the lake. 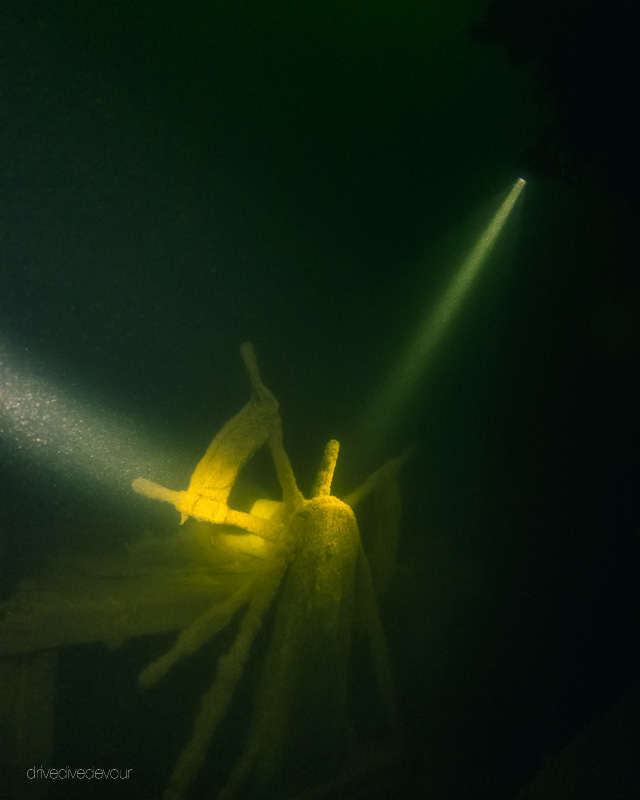 It was pretty dark at this depth, so I don’t have any photos to show, but as we went along with our flashlights we started to find old bottles strewn along the bottom. We collected a few for one diver’s personal collection and surfaced shortly after to the beautiful sunset in the photo above. Once we surfaced, they invited me to dive on a wreck that they and a local boat captain had recently re-discovered. The wreck was a steam-powered tug boat that sank in 1931. 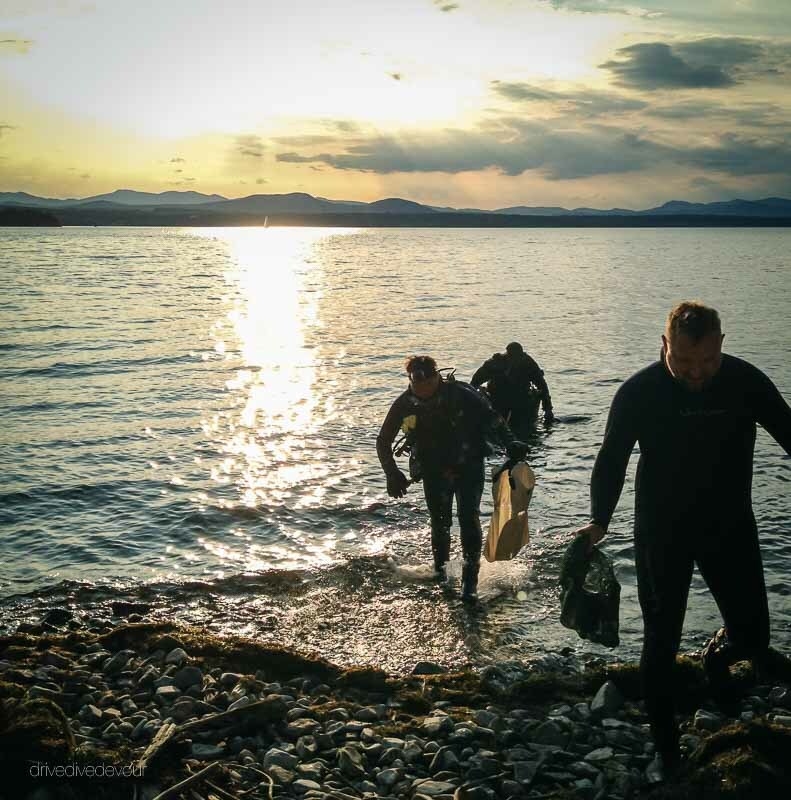 The Lake Champlain Maritime Museum found the wreck in 1996 and sent a few divers down to verify its identity. Even though the museum identified the as the US La Vallee, the location was not shared publicly in order to preserve the site. My new dive buddies invited me to dive this wreck with them and be one of the first to see it since the survey crew located it in 1996. As a thank you for the boat captain, I created this video to show the wreck and credit Larry’s Diving Services. The wreck lies at 105 ft near the current Ferry Lanes in Lake Champlain. The water at that depth is very cold and pitch black. Due to the depth, we only had one dive with a limited amount of time. Below is the video we managed to capture during that short first dive. I hoped to get back to it again but the weather didn’t cooperate and we had to move on. You can read more about the US La Vallee on the Lake Champlain Maritime Museum website. In addition to the US Lavallee, I dove a few other wrecks with Waterfront Diving. These were also on Captain Larry’s boat since the shop contracts with local dive boats. One of my favorites was the OJ Walker. The OJ Walker was a schooner-rigged canal boat which is basically a sailing cargo boat that designed to fit through the canals and locks to bring cargo up and down the Hudson river from as far away as New York City into Lake Champlain. The size of the locks determined the size of the boats and because of this archeologists can determine the age of the ship from its size. As time went on, the locks grew bigger and bigger in order to bring through larger and larger ships laden with cargo. 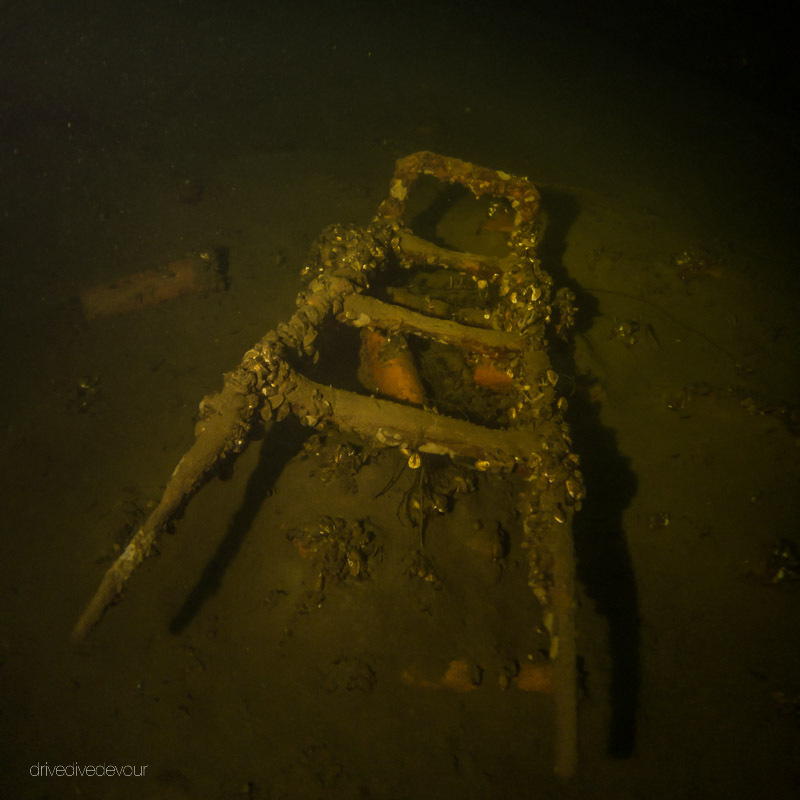 According to the Waterfront Diving website, the OJ Walker went down in a storm in 1895 carrying a heavy cargo of bricks and tiles. 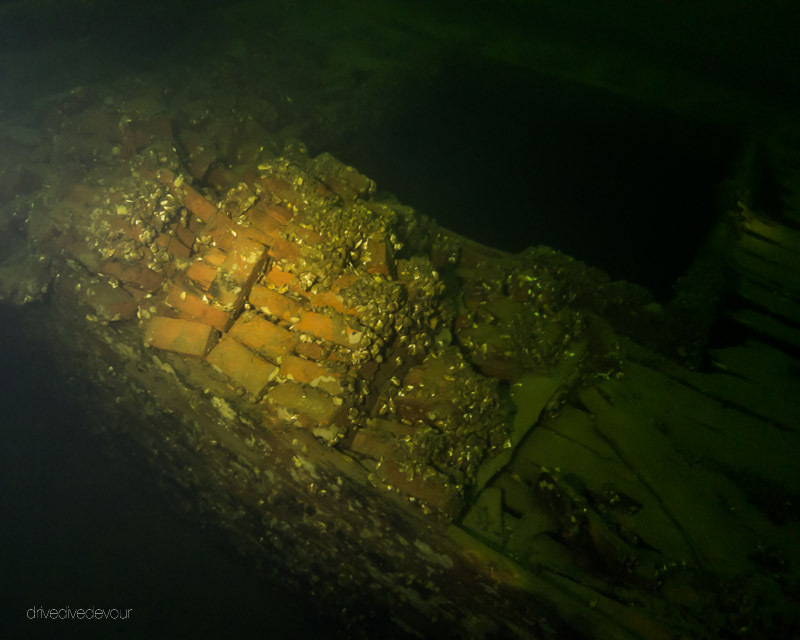 Even though this ship has been underwater for over 100 years it is remarkably well-preserved. The cold fresh waters of Lake Champlain serve to preserve these old wooden ships, unlike the ocean where currents and living creatures will quickly eat their way through a wood ship like this. 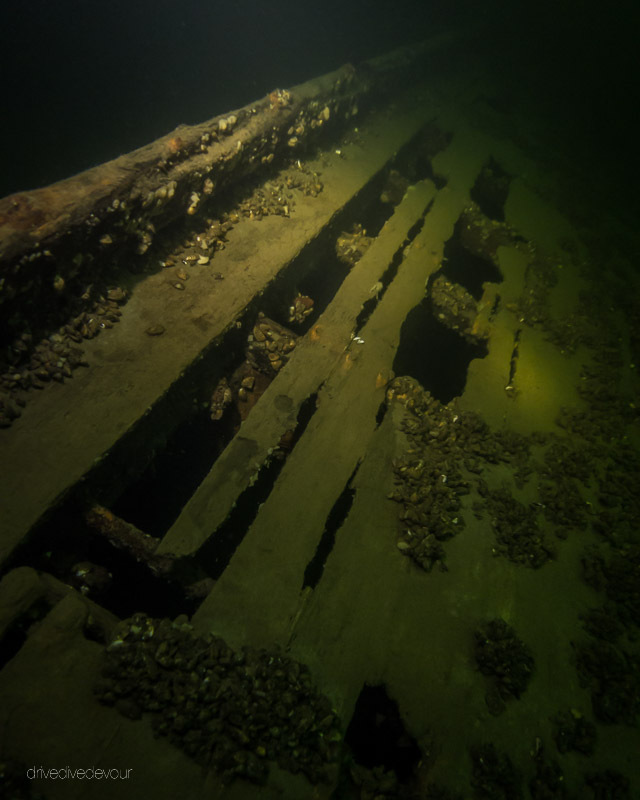 This wreck lies at a depth of 65ft and is considered an intermediate to advanced dive. 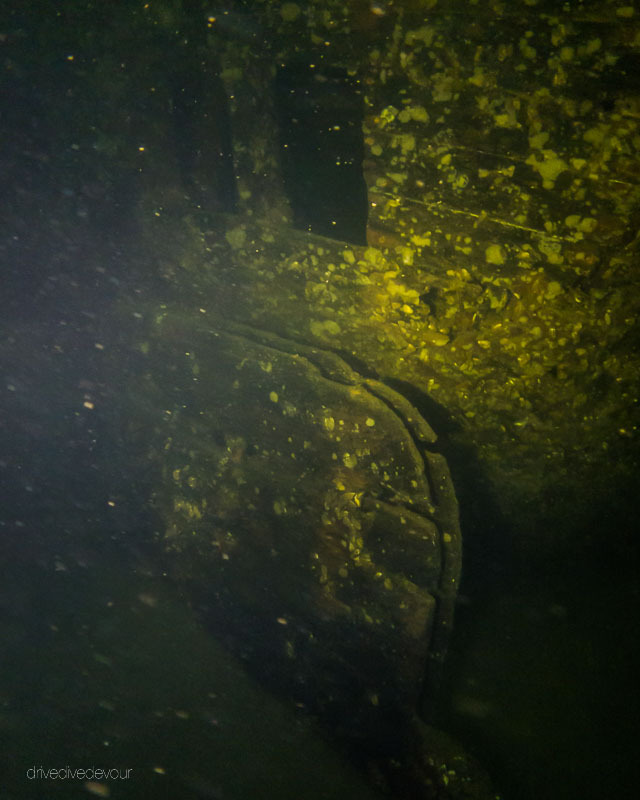 Good buoyancy control is mandatory to avoid running into and damaging the fragile structures on the boat and to avoid touching the bottom and kicking up a cloud of silt. Here some light still filters down from above, but a good flashlight really helps you take in the details of the site. In the gallery below, you can see the deck and mast of the OJ Walker as well as some of her cargo of bricks still resting on deck and one of the brick carts laying on the bottom near the ship. 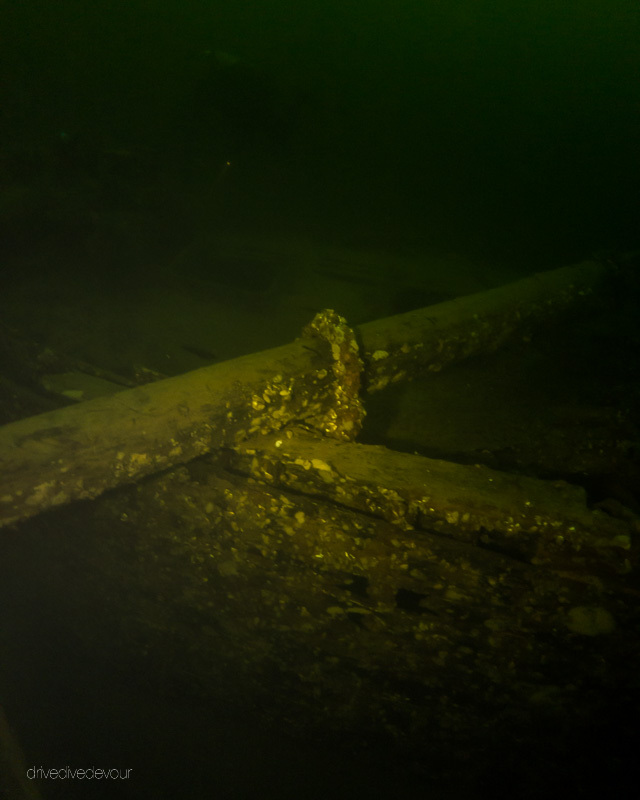 There are many other wrecks in Lake Champlain that all have their own story to tell. The Vermont Division for Historic Preservation puts out a very nice pamphlet that describes the wrecks, their history and gives specific location information. I picked up my copy from Waterfront Diving. 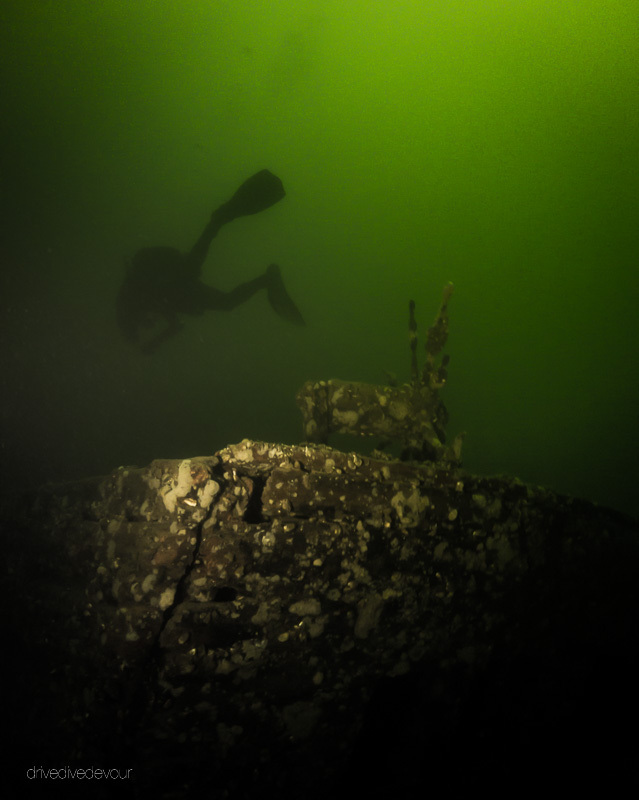 The diving is awesome and the vis is usually pretty good, but due to the water’s color, the lake it gets dark fast, so bring good lights. The water temp in the late summer is usually from the mid-60s down to the 40s at lower depths. There is no local recompression chamber. 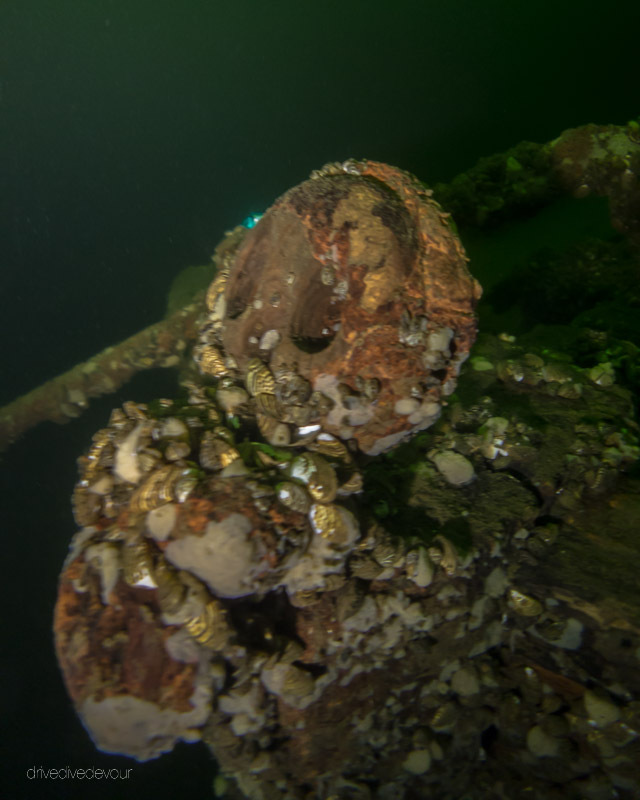 You need to fill out a special registration to dive the historic wrecks. Check with Waterfront Diving or Larry’s Diving Services for info. The locals are strange and you can pay them for most things with good beer. Sounds amazing to be able to dive and see wrecks like that. Learning to dive is on our list. Do you have a recommendation on a good place to go and learn? We heard The keys in FL is a good spot. Hi – Scuba diving is awesome. If you are at all interested, then do it. After I got certified I felt like I had to catch up on all the diving I missed by not getting certified earlier. To get certified there are 3 basic paths to take. 1. Get certified anywhere. I was certified in a cold somewhat dark quarry in Pennsylvania. Doing it this way meant that I had to wear a thick wet suit and really pay good attention to my dive buddy, because if they got too far away I might not be able to see them. The benefit to training in an environment like this meant that when I went to an easier environment like the keys or the Caribbean, the diving felt much easier to me and I was less nervous as a new diver. 2. Do you your book work and pool work wherever you are so you don’t have to spend time in a classroom in the keys. 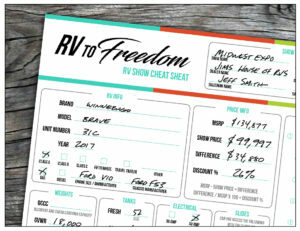 Then get a referral from them so that you can do your open water checkout dives in the keys when you get there. 3. Do the whole thing in the keys. Key Largo would be an excellent place to get certified. There are a lot of dive shops there. We dove with Horizon Divers when we were there, they are one of the more popular ones, but any of them would be fine. In Key Largo the reef is 3-5 miles off shore, so once you get to the open water diving portion then you will take a short boat ride to the reef. The depth of the reef varies from almost 10ft deep to about 30ft deep. The water is very clear, and the reef protects you from currents. It’s almost like diving in a salty swimming pool with pretty fish. Training here will give you some valuable boat experience as well that you wouldn’t get at a quarry. 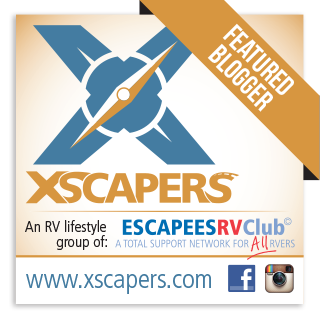 Things like boat etiquette, jumping in from the boat, exiting on the boat ladder, etc. Once you are certified through the class they will give you a temporary card so that you can go out right away and start diving. If you have any more questions, let me know. We might be in the Keys next winter (2016) If you are in the area we could get out and dive together. I’ll be diving Santa Rosa Blue Hole in New Mexico next week! It’s a deep, cold, clear, hole in the ground formed by an underground river.